Time has slipped away from me lately. Suddenly it's March and I was pretty sure I had at least a week left in February. Since when are there only 28 days in February anyway? In the last week and a half, I have visited 5 museums in 3 different cities: The Art Institute, Chicago for the permanent collection, of course, and Edvard Munch; The Marlborough Gallery, New York City for some Cubist sculpture; the Rodin Museum in Philadelphia; as well as the Philadelphia Museum of Art and the Barnes Foundation for Renoir's centrifugal swirls of color. Speaking of the Barnes, it's such a singular place, dedicated as much to one man's idiosyncratic view of art as to the objects themselves. When Albert C. Barnes established the foundation in 1922, he stipulated that his collection be forever hung in precisely the same organization as he had devised himself. The most amazing part is his insistence on symmetry, which necessitated buying pieces in part according to their size and how they would fit into the overall scheme. But the Barnes Foundation is moving. Right now, it's still housed in the Barnes mansion in Merion, the pictures hanging on the same walls on which Barnes had placed them, their arrangement punctuated by small, decorative metal objects positioned between pictures, in an almost salon-like arrangement. On an as yet undecided date, the collection will be relocated to Philadelphia, to a new building which, it is claimed, will maintain the layout of the original house. 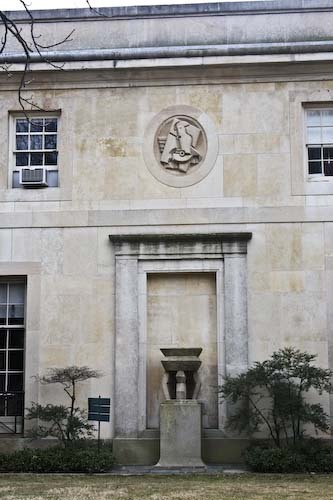 But the mansion will have to stay behind, and with it, those Jacques Lipchitz reliefs which Barnes commissioned from the artist the year the foundation was started, about 20 years before Lipchitz fled to New York as a war refugee, and which decorate the house's facade. The setting will no longer be a somewhat secluded domestic location, but a modern building near the Rodin Museum and the Philadelphia Museum of Art. So while the collection will be more accessible to the casual visitor (right now an appointment must be made at the foundation and I have no idea if this will change in the future), something of its status as personal collection (in the vein of the Frick Collection, for instance) will be lost. But since this blog is about food, and not art, I won't belabor the point except to say that if you're near Philadelphia, and you haven't been, make an appointment and see the collection the way it is truly meant to be seen, before you no longer have the opportunity. And then yesterday in New York, it was snowing. Actually, I guess yesterday in most places it was snowing. One of those huge blizzards that tries to make up for a relatively dry winter in one massive blow. Actually, that's fine with me, because while Mother Nature reigns down her snow drifts, I made some pretty wonderful snow of my own. Homemade ricotta. Which, by the way, is embarrassingly easy, with only two ingredients and almost no hands-on time. And what you're left with is a pillowy kind of ricotta to rival any of those fluffy flakes still falling, and, I imagine, infinitely better for snow balls. This was February's Recipes to Rival challenge, but February snuck out in the middle of the night without even a word, so I'm a couple days late. And I still don't know exactly what to do with my ricotta, as anything this special deserves something extraordinary. But that's another post for another day in the very near future. Into a very large pot, pour both the milk and the buttermilk. Heat slowly over medium low heat until it reaches a temperature of 185 on a thermometer. At this point, the mixture will have begun to separate into curds and whey. Stir occasionally so that no curds stick to the bottom. Line a collander with cheesecloth and set over a large bowl or in the sink. Spoon the curds into the collander, separating the curds and whey. Tie the ends of the cheesecloth together and hand like a sack for 10-15 minutes. I hung it over the nozzle of the sink. Remove from the cheesecloth and place in an airtight container for storage. UPDATE: Evidently this is a bit of an impostor, although it can be used in place of ricotta in any recipe. Thanks to Mark, who drew my attention to the fact that, and I quote "Ricotta is the oddball of the cheese world. During the cheesemaking process, the curds are separated from the whey, pressed, and subjected to various types of fermentation. Romano cheesemakers discovered that the discarded whey contained small amounts of protein which could be cooked to render additional curds." 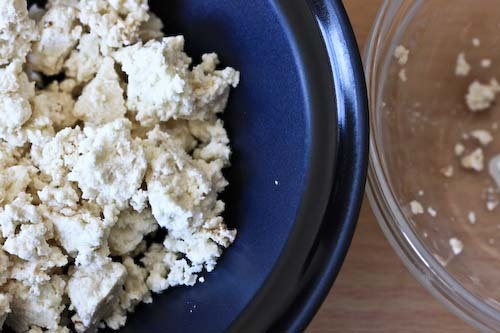 As you can see from the above recipe, these curds are rendered only once, making this more of a farmer's cheese (or paneer, queso fresco etc.). Mark also gave us a link to a great site on cheesemaking in general, with a post on ricotta (among others). Isn't it nice to have such informed readers? Everyone give Mark a nice big "thank you!" Oh looks delicious! I absolutely adore homemade ricotta...in New York I often treat myself to the stuff at DiPalo's, but clearly there's no need to leave my house to get my fix! 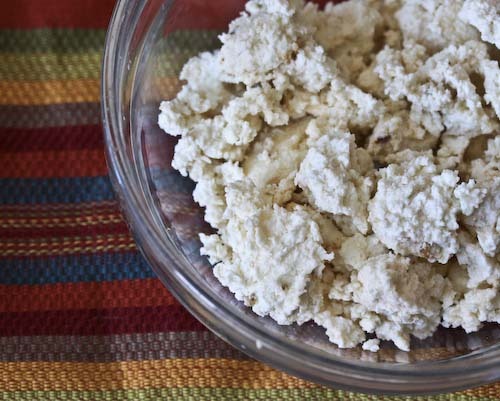 oh I feel like the last blogger to attempt homemade ricotta... and i love it so much! i need to get on the ball. However, this is actually farmer's cheese (or paneer, queso fresco, etc.). Freshly made, this is a fantastic cheese, and this is the basis of most cheese except for ricotta. See, ricotta is the oddball of the cheese world. During the cheesemaking process, the curds are separated from the whey, pressed, and subjected to various types of fermentation. Romano cheesemakers discovered that the discarded whey contained small amounts of protein which could be cooked to render additional curds. I believe ricotta means "re-cooked" in Italian. Nice job, your cheese looks great. And Mark is correct. I actually made real ricotta by recooking whey from some mozzarella curd and the link he provided to Fankhauser is a great reference page for cheese, among other wonderful things. Didn't know how easy this was? Is it worth making? Is it that much better than what you can buy? This really helps me appreciate why cheese is so pricey! Super-concentration! This is very easy, thank you so much for the inspiration. I am running over to Grocery Outlet (a cheap surplus food store) ASAP and buying so much milk! i love the barnes- and i'm ecstatic that it's moving to the parkway where i can actually visit regularly. can't wait to try the ricotta. i get mine at claudio's in the italian market of philadelphia, it's the most delicious cheese in the world. I never knew how easy this was, and I'm sure it would make any ricotta recipe that much tastier. Maybe a fantastic homemade cannoli? Or stuffed shells? Have fun experimenting! Mark, thanks for all the great info! I'm going to update the post now. In my defense, I was only following the recipe given to me by the monthly cooking group Recipes to Rival, which billed it as ricotta. Sometime I'd love to give the real stuff a try! Unconfidentialcook, it's a nice, mild cheese, very fresh tasting. I'm using it in a recipe as we speak, so I'll let you know how it stand up to cooking. But yes, I'm glad I made it. At least for the experience! Meg, I have mixed feelings about the Barnes moving. I found it pretty easy to get to where it is, but I think it will be a great thing for Philadelphia to get it moved more to the city center. I'll gladly visit both places! It was my first time in Philadelphia and my friend and I both agreed that it's a great city and even better than we expected! Making your own ricotta sounds like fun. hey! ok, so it isn't "real" ricotta? But could you use it effectively in lasagna etc? It sounds great. I want to try it. Do you add salt after you make it? or does it need it? Virginia, you could definitely use this in lasagna or any other preparation you'd use ricotta in. I didn't salt mine afterward, because I wanted to use it for both a sweet and savory recipe, but if you're using it for lasagna feel free to add some salt. Just taste it after you make and decide then. I personally think it's tastes wonderful and it's behaved itself perfectly in everything I've use it for so far! I am sorry I missed this when you first posted. Thanks to Mark for explaining the differance between Ricotta and what we made. No matter what it was called it was still good. I like what you ended up doing with it.